We tried out the original Nest Cam Outdoor and the newer Nest Cam IQ Outdoor to see how they compare. Both have a lot to offer, but which one is best for your home? Below we’ll dig into what makes each camera great, what sets them apart, and which one is the best option for you. *Standard retail prices as of 1/17/2019. Prices and availability are subject to change and can vary by retailer. Should you add Nest Aware? Before you buy any Nest camera, you should know that many camera features are available only with a Nest Aware subscription. Nest Aware also adds person alerts to the original Nest Cam and facial recognition to the Nest Cam IQ. Our tester thought the Nest Aware features were worth the cost of the subscription—especially since their home is in a relatively busy area with lots of cars and people passing by. Our tester thought the Nest Aware features were worth the cost of the subscription—especially since their home is in a relatively busy area with lots of cars and people passing by. In our book, the $5/month plan is a good deal that will cover most needs, but if you don’t need the extra features you’ll still be able to use the camera without a subscription. Nest’s original outdoor security camera doesn’t have a lot of flashy extras, but you get everything you’d expect from a solid security camera—motion detection, night vision, two-way communication, and live video. Size: 2.8 x 2.8 x 3.5 in. All the features listed below are available without the Nest Aware subscription. Motion detection on the Nest Cam Outdoor works just like you’d expect. It picked up on cars and people walking by and sent alerts. There are no options to adjust the sensitivity of the motion sensors, so while we had no issues, people in some areas might find the notifications too frequent. One thing to note—there are no options to adjust the sensitivity of the motion sensors, so while we had no issues, people in some areas might find the notifications too frequent. We were pretty happy with the night vision on this camera and could see details fairly well. However, we did notice that if someone was too close to the camera the image was too bright for us to make out details of their face. This camera has basic two-way audio for communicating with people at your door. It isn’t quite as nice as the audio on the higher-end IQ cam, but there were no issues. Outdoor cameras, by nature, require a bit more work to install. But Nest makes it as simple as possible—most people won’t need more than a drill and 30 minutes or less. Nest makes it as simple as possible—most people won’t need more than a drill and 30 minutes or less. 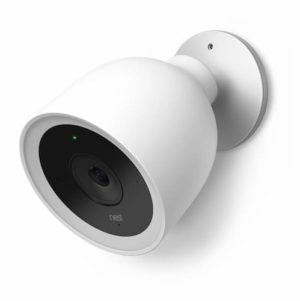 The original Nest Cam Outdoor has a magnetic base, so if you’re lucky enough to have a convenient magnetic surface outside your home, you may be able to install the camera without even using your tool kit. If not, you’ll just have to drill a few screws. It took our tester less than 30 minutes to install the camera and set it up with the app. Want a better idea of how the install process works? Check out Nest’s video detailing the process. At $199, the Nest Cam Outdoor is right in line with similar-quality security cameras from reputable brands. It’s not a steal of a deal, but it’s a fair price. The Nest Cam IQ Outdoor is a serious upgrade with better audio, a larger sensor, and resistance to more extreme temperatures. It’s a bit larger and heavier, but it feels sturdy and looks modern. It’s quite a bit more expensive than the original Nest Cam Outdoor, but if you’ve got the money to spend, it’s worth the extra investment. Size: 5 x 3.7 x3.7 in. The Nest Cam IQ can tell the difference between people and objects and send you specific alerts if a person approaches your home. If you add a Nest Aware subscription with facial recognition, it can also learn to spot specific people—handy if you have kids coming in and out, or a house cleaner stopping by once a week. The IQ camera comes with impressive color night vision, which gives you a much more detailed picture of what’s going on outside your home. It might not be essential, but it’s very much appreciated. One feature we loved about the Nest Cam IQ was the close-up tracking. Once it detects motion it will zoom in and follow that motion. It’s perfect for giving you a clear picture of what’s happening, whether someone is stealing packages from your porch or dropping off freshly baked cookies. Our tester compared the original Nest Cam and the Nest Cam IQ side by side. They noticed the audio on the larger IQ cam was noticeably better, which could be important if you’ll be using the camera to check in with visitors regularly. Our tester noticed the audio on the larger IQ cam was noticeably better, which could be important if you’ll be using the camera to check in with visitors regularly. 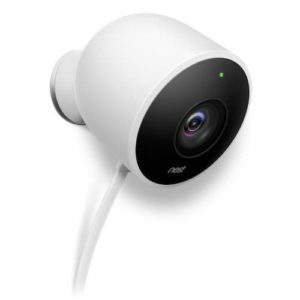 The Nest Cam IQ is larger, heavier, and sturdier than its predecessor, but the installation process is about the same. You just need to pick your spot and drill a few screws. The ideal setup also requires drilling a hole through your exterior wall so you can plug the camera into power inside your house. This makes the camera a bit more secure but could be inconvenient. If you don’t want to drill through the wall (we didn’t), you can plug the camera into an outdoor power outlet, but you’ll have to purchase a separate $49 weatherproof power adapter. For more info about how the install process looks, check out Nest’s installation video. At $349, the Nest Cam IQ Outdoor will set you back a bit. If you’re not up for spending that much on a camera, you’ll be okay with the smaller original outdoor camera. But if you’ve got room in your budget, the IQ Cam earns the price tag with all its handy high-end features. Our tester preferred the Nest Cam IQ Outdoor because it felt sturdier, had a noticeably better speaker, and because the color night vision made it easier to clearly tell what was happening outside. If you’re ready to spend a bit more and you’re looking for more serious security, it’s a great investment. If not, the less expensive original Nest Cam Outdoor will still serve you well. Looking for a bit of security inside your home as well? Check out our review of Nest’s indoor cameras.